If you're anything like yours truly, you spent a nice chunk of your weekend stalking your interior decorator insta-crushes who were attending Paris Deco Off, the yearly five-day event where the best labels and designers from the interior world showcase their stuff and unveil new products in exhibitions that will make you (or at least me) drool (I know, that's so French-girl-cool of moi). 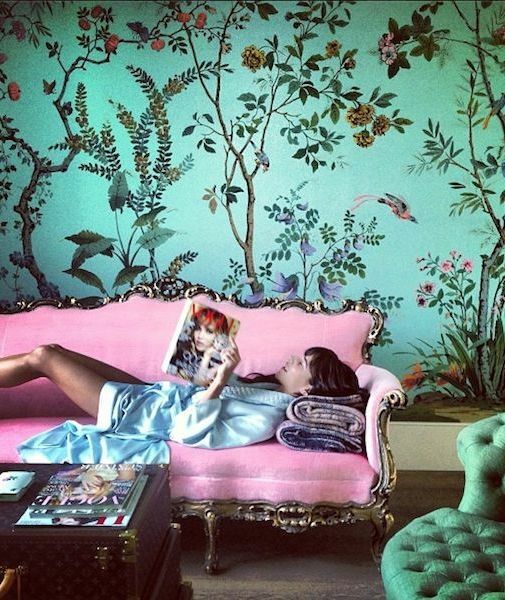 It's no surprise that one of the must-see showrooms was De Gournay's, the name behind those beautiful hand-painted Chinese wallpapers that provide the backdrop to what seems like anyone and anything extra-chic (see, e.g., more of my insta crushes, Alice Naylor-Leyland, Poppy Delevingne, and Caroline Sieber). The whimsical silk chinoiserie of De Gournay has also recently taken a much-welcome field trip from the walls to the closet, thanks to collaborations with Moda Operandi and Aquazzura. So it's really no surprise that other designers have caught on to the floral and bird motif-craze, which inspired today's post. Because (perhaps for the first time ever), it's now very in-vogue to have your clothes match the drapes.